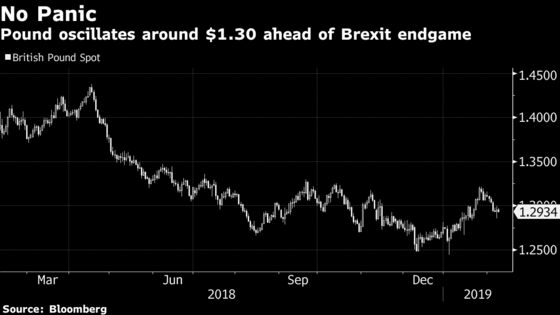 (Bloomberg) -- At the Bank of England’s first meeting of the year, Governor Mark Carney tapped into the Brexit conundrum facing pound traders -- the currency’s next move is likely to be a big one. Sterling has pulled back this month to hover below $1.30 after rallying in January as no solution is yet in sight to avoid Britain crashing out of the European Union in less than 50 days. A resolution could move the currency as much as 20 percent in either direction, with traders unwilling to put money on the line when the chances of no deal are roughly as likely as a deal, according to Commerzbank AG. The economic “fog of Brexit”, as cited by Carney last week, may be reflected in manufacturing and gross domestic product data on Monday. Investors will then focus on the political debate, with the government due to present a Brexit motion to Parliament Thursday even though Prime Minister Theresa May hasn’t won concessions from Brussels so far to persuade lawmakers to back her deal. With both May and EU negotiators agreeing to keep talking, Credit Agricole SA is upbeat on the eventual outcome. It recommends a six-month call spread, targeting a move toward $1.37 -- a near 6 percent appreciation from current levels.